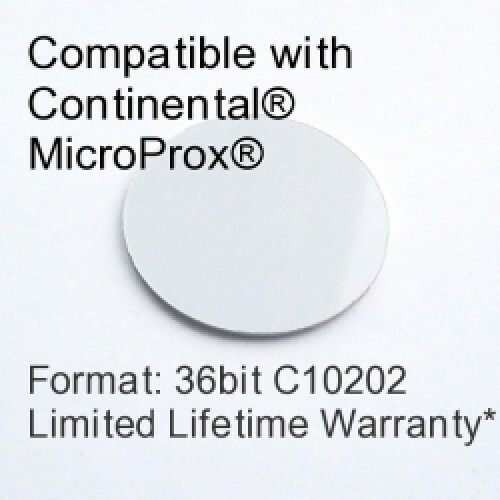 This Peel and Stick Proximity Tag is compatible with Continental® MicroProx® and is programmed with 36 bit format C10202. This item is programmed to your specifications and is designed for access control, event security, and time & attendance tracking. It includes a Limited Lifetime Warranty against errors in manufacturing. Save up to 50% with our high quality products over other brands. The PSTag-C36 Proximity Tag has an adhesive backing and is perfect for attaching to any object. For example a cellphone, credit card, etc. The dimensions are: 1.19" wide and .039" thick. 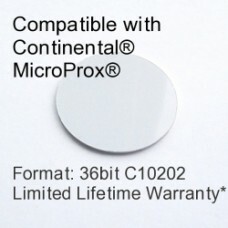 This Proximity Tag is in standard 36 bit format C10202. The internal Facility Code can be any number between 0 and 65,535. The internal Card Number can be any number between 1 and 65,535. Please add any special instructions to the notes section on the order checkout page. If you do not specify a Facility Code or Starting Number when ordering, the default Facility Code or Starting Number below will be used. Please call us if you need help determining the correct Facility Code or Starting Number. Please click on the 'Related Products' tab to see other products that are compatible with the 36 bit C10202 format. Perhaps you would like the convenience of having a Proximity Card to keep in your wallet that matches your Peel and Stick Tag.